Happy Father's Day! To all the dads out there and especially to mine! My dad was the one who got me into anime, comics (DC, Marvel and the Archies), Warner Bros, Disney, pretty much everything that was artistically inspired in Pop Culture. He was also cool with my sister and I playing video games. It was great. My dad, little sister and I were all into Dragon Ball Z too and we would all watch the episodes and movies together. Dragon Ball Z was something we all followed for years and dad took great efforts to obtain the latest movies and episodes for my sister and I. 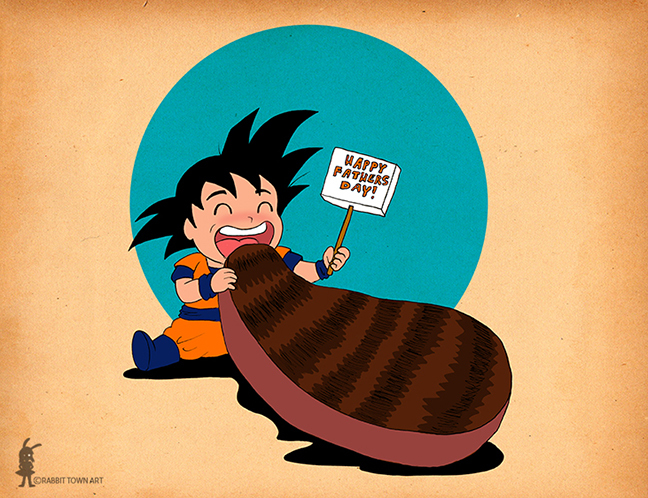 So here's a tribute to those moments and Goku eating a steak! My dad love's his food too! Especially my mum's steak. That said...thinking about it, this little one here could be Goten. Well, hope you had a great day Dad and see you soon!